The summer of transformation at CAU. 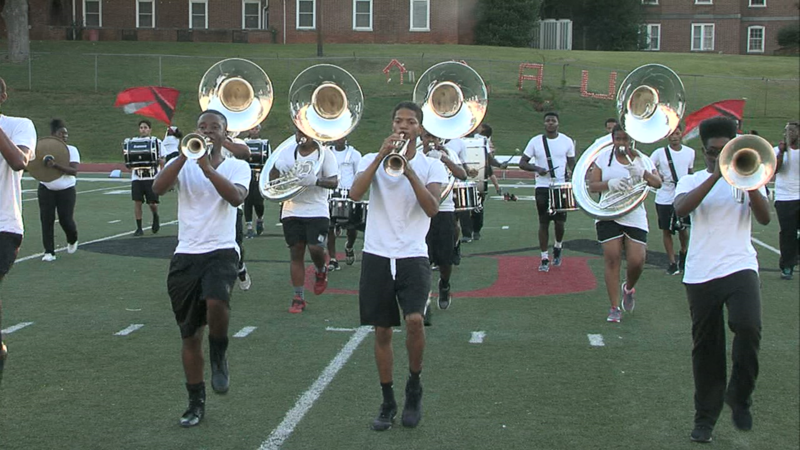 Clark Atlanta made history this spring by hiring the first female band director in the SIAC. The real gem of Tomisha Brock’s story is not her hiring, however, but the work she’s done since June for the CAU Band. Brock had no idea of the shape that CAU’s band had fallen into. At her interview, she assumed it was a smaller than usual outfit but she had no idea what she was about to hear next. “As part of my interview, the drum major actually asked me would you like to know how many members we have? I said sure. So I’m thinking the number is going to be about 48 or 64. She said we have six people. I said are you serious,” is the story Brock recently recounted in her office just a few weeks ahead of the season. She didn’t get up to leave the table upon hearing this and she managed to get 64 people in the band ahead of Thursday night’s home and season opener. To be precise Brock says she has somewhere between 68-71 kids on her roster heading into the season. She’s already thinking about next season, targeting a goal of 96-128 people to be a part of the program. That’s a long way from six. Brock knew she had to do three things in order to turn things around at CAU. #1) Recruit more kids. #2) Get on the same page with alumni. #3) Quell any fears or concerns that parents of potential students might have. That kept her very busy. “When I first got here in June I was probably averaging 80-90 hours per week, Monday through Saturday and some Sundays at one point,” Brock said. Now in August, she has managed to get that down to a Monday through Friday schedule and don’t even think about calling her after 6pm. After visiting with the Band a few weeks later, it’s clear that she is still whipping them into shape. Every turn, every note, every step must be on point because there are no restarts in the game. “I need you to feel the beat and know that A) I don’t move until count eight. Understand,” Brock barked to the band over her megaphone. The band fell back into line repeating the same song again and again. Like any true visionary she’s not overlooking what’s in front of her she’s just able to see what’s beyond. Her worries aren’t about opening night, homecoming or even the Chicago Classic. She’s planted a flag in her mind about securing another invitation to the Honda Battle of the Bands and becoming the second HBCU to win the coveted Sudler Trophy. Those dreams will manifest into their first steps towards fulfillment on Thursday night as Clark Atlanta hosts Mississippi College at 7 pm.